New record of a snake species in Singapore! A new record of a snake species in Singapore has been found from the Central Catchment Nature Reserve (CCNR)! Two blackwater mudsnakes (Phytolopsis punctata) were found at Nee Soon Swamp Forest in CCNR on 12 Sep 2014. 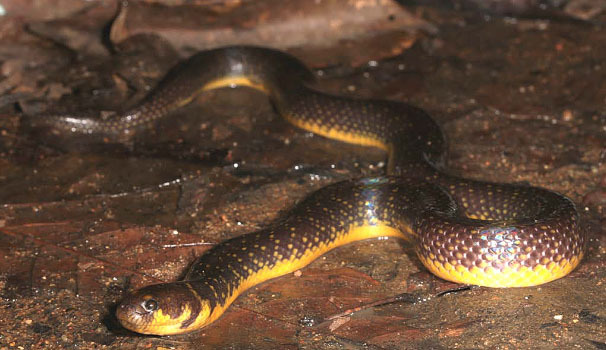 Little is known about the biology of the snake as they are rarely recorded, possibly owing to their secretive habits in highly threatened habitats associated with peat swamps and acid-water in Peninsular Malaysia, Sumatra and Borneo. Blackwater mudsnake (Phytolopsis punctata). Photo by: Noel Thomas. 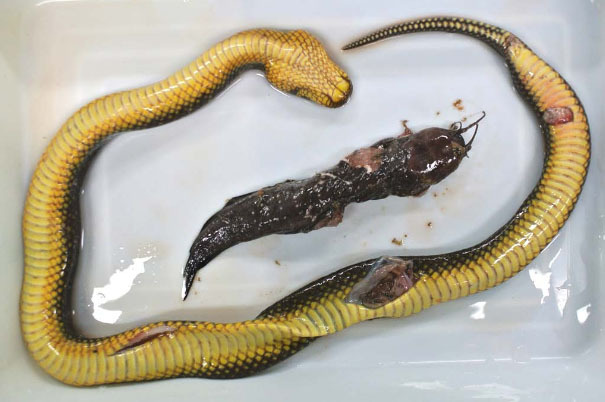 However, a third snake was found dead on 22 Nov 2014, with a forest walking catfish (Clarias leiacanthus) in her gut. This was possibly the first recorded diet item of the blackwater mudsnake. We now know what the snake eats! Partly digested forest walking catfish (Clarias leiacanthus) found in the gut wall of the blackwater mudsnake. Photo by: Tan Heok Hui. These observations were made as a result of a survey of the aquatic biodiversity of the Nee Soon Swamp Forest by the National Parks Board and the National University of Singapore (Tropical Marine Science Institute, Department of Biological Sciences, Department of Geography and the Lee Kong Chian Natural History Museum).